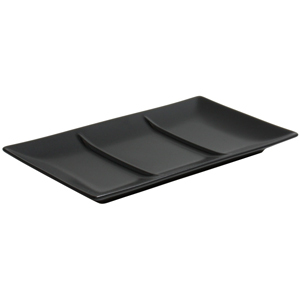 The Midnight 3 Compartment Black Stoneware Plate offers impressive food display. With space for serving up to 3 different cuisines alongside one another, these rectangular serving plates are perfect for buffets or dinner parties. Ideal for Mediterranean or Asian food, this divided plate keeps each dish separate.